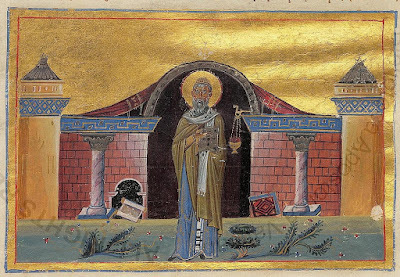 On the twelfth of this month [December], we commemorate our Venerable and God-bearing Father Spyridon the Wonderworker. His wonders have still not ceased. This Saint flourished during the years of the reigns of the emperors Constantine the Great (306-337) and Constantius (337-361) his son. According to intelligence he was a simple man, and according to his heart he was humble. Thus from his youth he was a shepherd of sheep. Then he received a wife into lawful marriage. After the death of his spouse he became a Bishop. This Saint was given such grace to work miracles and healings, through his simplicity and purity, that due to his numerous miracles that he worked, he received the nickname Wonderworker. For in a time of drought he brought down rain through his prayers. And because this rain became too much, he prevented it from excessively falling. When the sellers of wheat contemplated making people go hungry, the Saint vanquished their plans. For through his prayers the granaries that stored the wheat fell. He changed a snake into gold, and after this gold ceased the misfortune of a poor man, the gold became a snake once again. He also calmed the current of a river. To a prostitute who dared to approach him he revealed her sins, and by this he persuaded her to repent and confess. 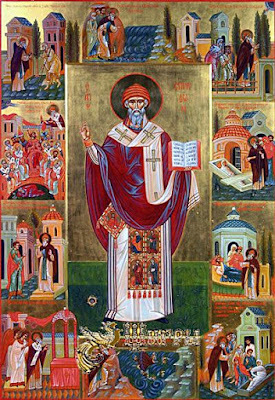 He was present at Nicaea during the First Ecumenical Synod which gathered together in the year 325, and by the power of the Holy Spirit he silenced the heretical Arians, who took pride in their external wisdom and eloquence. He raised his daughter from the dead, in order for her to reveal where she hid a valuable vessel that belonged to a woman. He liberated Emperor Constantius from a calamity he suffered from. He raised from the dead a child of a certain woman, after which she died from her sudden joy upon receiving her resurrected son back. When the fire from the lamp extinguished due to lack of oil, he made it gush forth with oil. He healed the Deacon who had no voice, by which the Saint had previously punished him. For he was ordered to say a prayer abbreviated due to the extreme heat, but out of his pride he prolonged it. This Saint caused the death of a woman who had committed adultery, for she denied it because she did not want to confess her sin. For even when she gave birth to the child of her adultery, she was saying she conceived with the assistance of her husband, although her husband was gone for twenty months while on a journey. 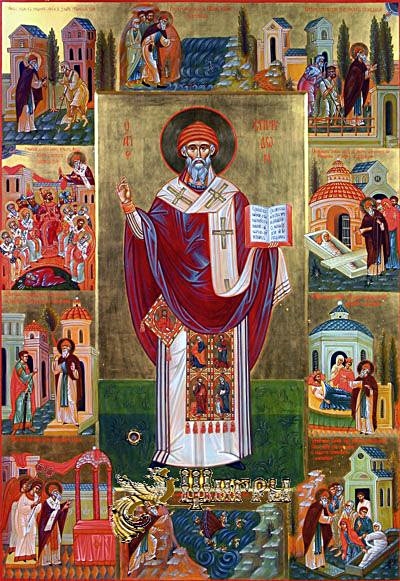 When this Saint liturgized, Holy Angels attended to him and liturgized with him. When he said, "Peace be with all," they replied together outside, "And with your spirit." They also made responses to the usual responses. One hot day the head of the Saint looked as if it was full of sweat, at a time of day when the sun was at its hottest. Then his hairs became white, black and blonde. God showed by this His favorable honor towards him. The amount of the sympathy and compassion of this divine Father was manifested, when he assisted those thieves who went into his sheepfold to steal. For, not only did he restore their sight after they lost it, but he also gave them a ram as a gift, saying, "Take this so that your efforts and your all night vigil would not have been in vain." He urged Bishop Triphilius with a warning, to not give in to the delights of the world, but to long for heavenly things. Due to his forbearance, he made a man fall at his feet and ask for forgiveness, after he secretly held back payment to him, thinking the Saint would mistakenly overlook it, for this man had greedily taken one goat over than the payment he had given. And this blessed man did many other things, full of wonder and astonishment. And after having managed well his rational flock entrusted to him, he departed for the angelic state and behavior. His Synaxis is celebrated in the august Temple of the Chief of the Apostles Peter, which is next to the most holy Great Church. Thou wast a champion of the First Synod and a wonderworker, O God-bearing Father Spyridon. Thou didst speak to one dead in the grave, and change a serpent to gold; and while thou wast chanting the holy prayers the Angels were serving with thee. Glory to Him Who has glorified thee; glory to Him Who has crowned thee; glory to Him Who through thee works healings for all. Thou didst lend wings to thy mind with the fire of the Spirit, wounded by love for Christ. 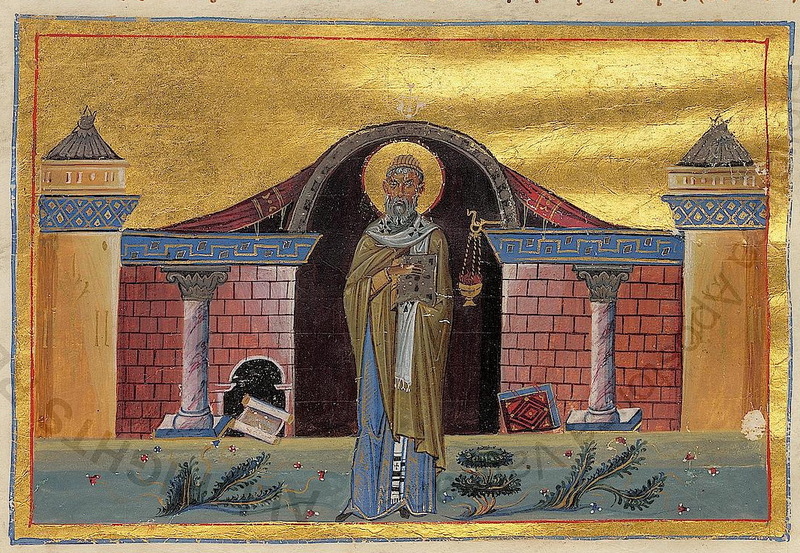 Thy practical work was the practice of contemplation, O inspired Spyridon. Thou didst become a divine altar, imploring illumination for all.